One of the best things about being in our industry is that every single project we work on is different from the next. Even when kitchen and bath trends are put into action, the applications are always different because no space is the same. 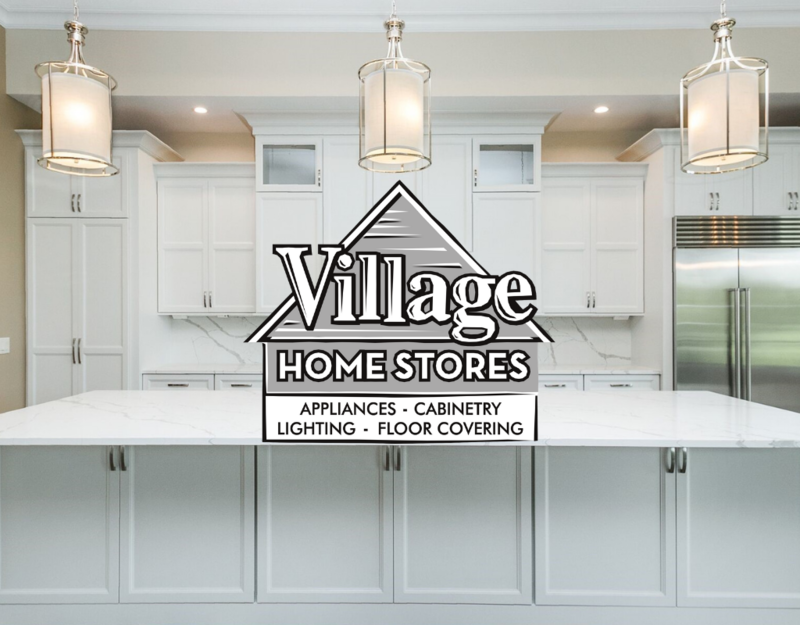 Village Home Stores has the great privilege of placing our designs and products in new and existing homes in the extended Quad Cities Region and we love each project we complete. 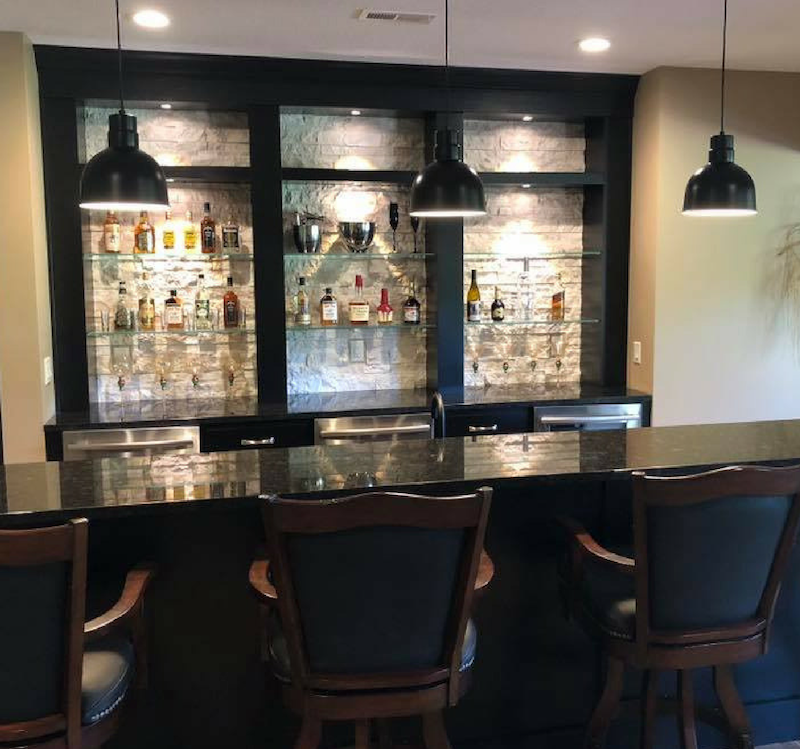 We normally don’t admit it when we have favorites… but this week’s featured remodel story in Bettendorf, Iowa is one of our favorites fromf the year for sure! This Bettendorf, Iowa customer found Village Home Stores by catching our weekly television show that airs every Sunday at 9am on WQAD. 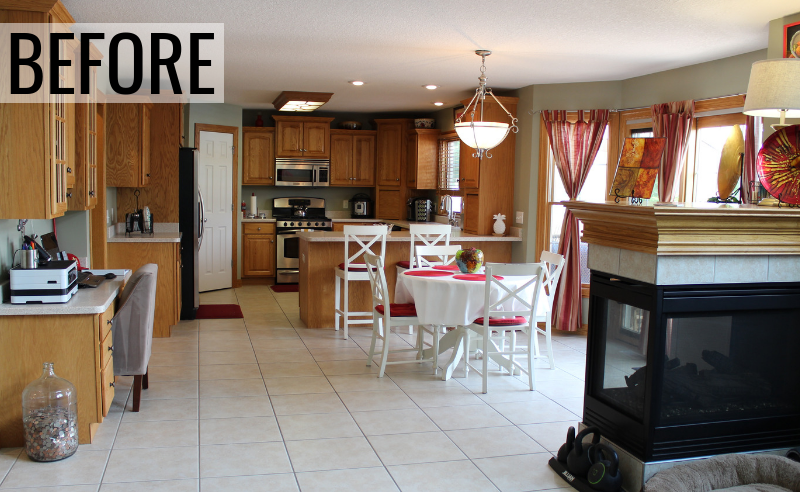 On the Village Home Show we are able to showcase remodel stories from right here in the Quad Cities area. So when this family was ready, they knew who to call. The original oak cabinetry layout really divided the kitchen from the dining and living spaces. There is a beautiful outside pool area just steps away from the kitchen in this home. With the peninsula in place, it was a long voyage to the kitchen sink from the pool. 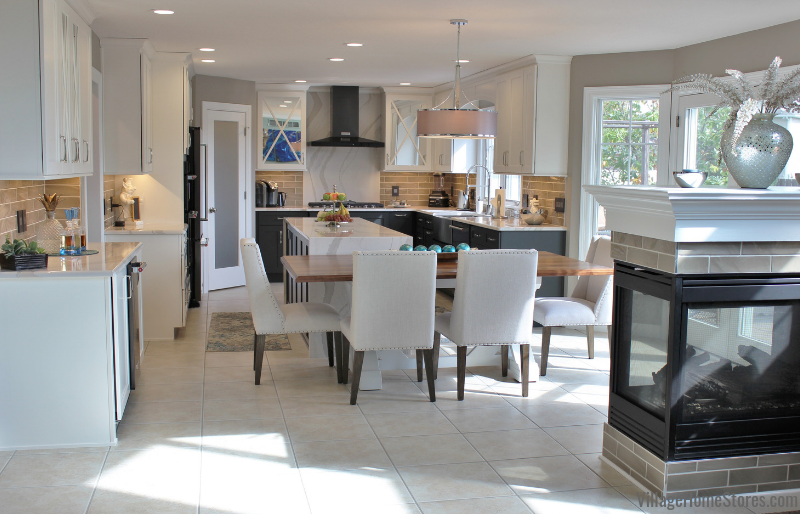 We were so thrilled with the ideas they came to us with for a more open concept kitchen. When we say that the kitchen is the hub of the home, this household is a great example of that. With access to lofted living room and the backyard pool retreat, this new kitchen design needed to be functional and stylish. 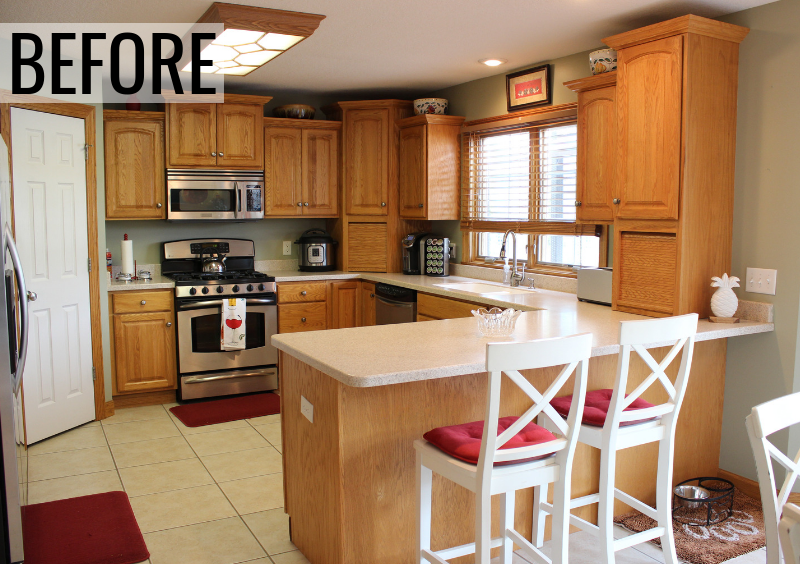 We began by removing the original kitchen… but kept one main element in place to help save some cost to the clients. 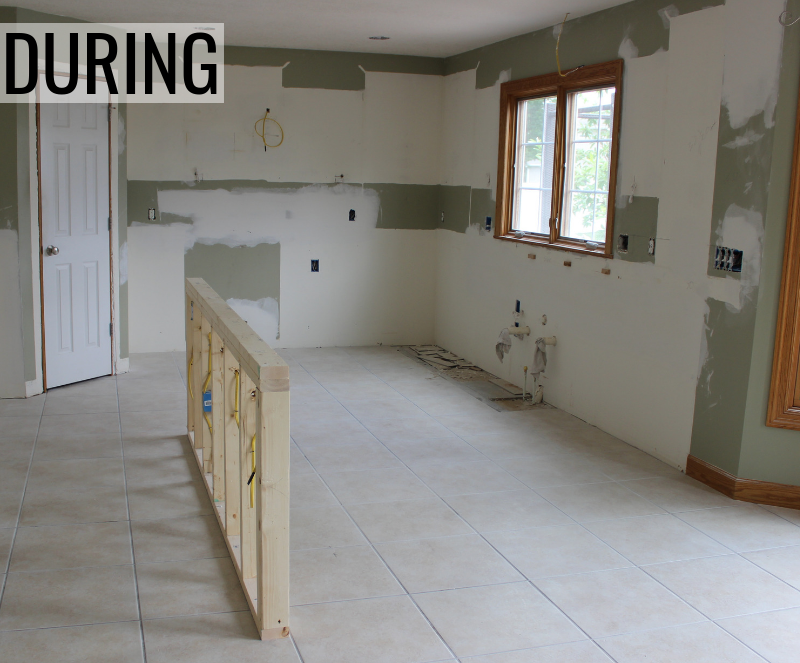 This kitchen has been given a whole new look but we kept the original tile floors! That’s right! Because the tile flooring was installed before the original kitchen cabinets went in, there was no void left when we tore out the kitchen peninsula. 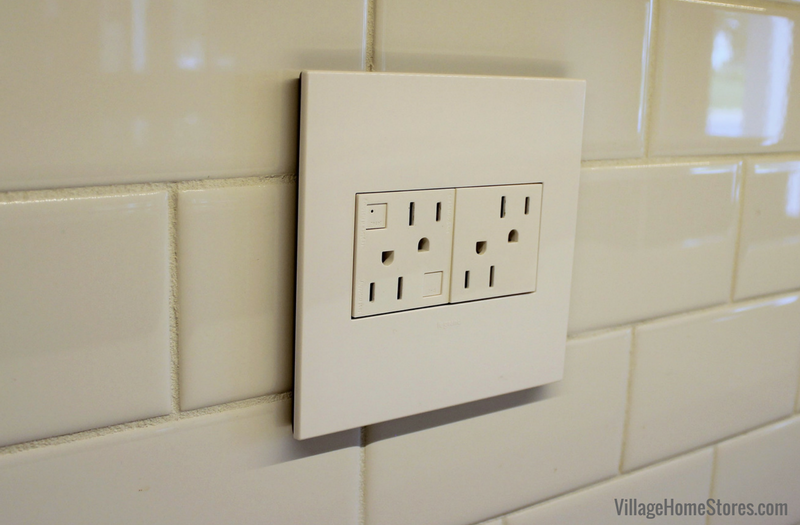 A new knee-wall was installed with power for island outlets. 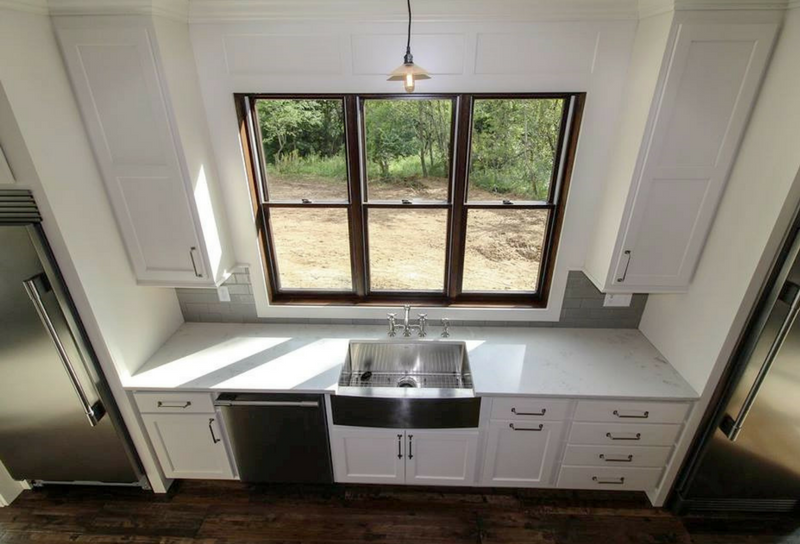 Take one more look at the original oak kitchen with the peninsula + table layout…. …and now the kitchen absorbs the dining space into one cohesive look. In fact, the kitchen and dining spaces are now joined into one concept by an incredible and versatile island design. The overall space has been brightened up significantly with lighter, airy material selections, added lighting, and the installation of mirror in some cabinetry. 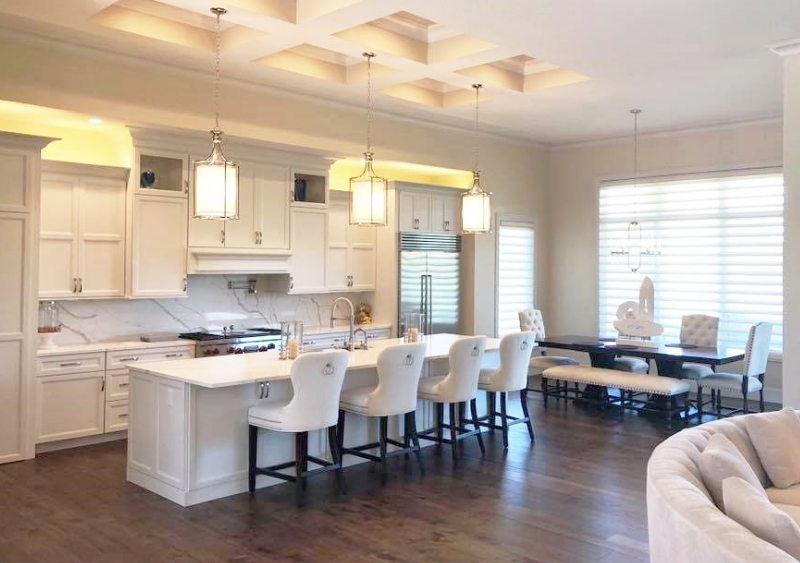 A large kitchen island is the centerpiece to the new open concept. On the end near the backyard access, a custom table has been placed at dining height. We designed the dining table to be placed right next to the kitchen island. However, the table can be moved out if needed. 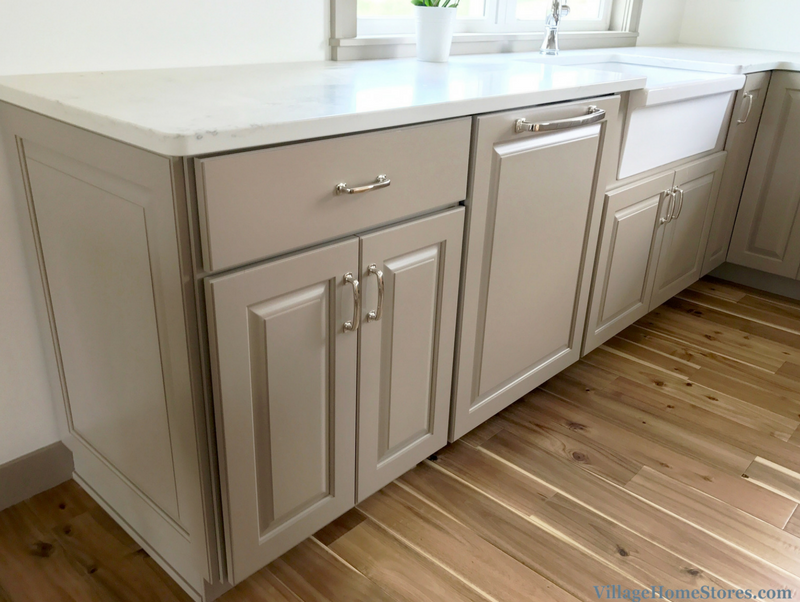 A custom wood base was built for this design by our carpentry team and our painters painted it to compliment the kitchen cabinetry and trim. A gorgeous wood top from our Craft-Art line was secured on top of the base. 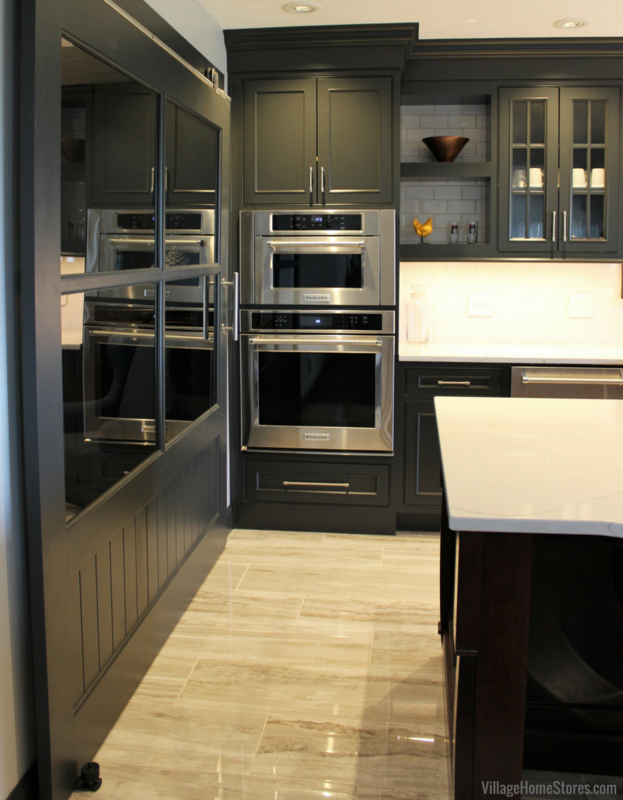 With the main kitchen cabinetry all in painted finishes, a woodgrain was a welcomed element. 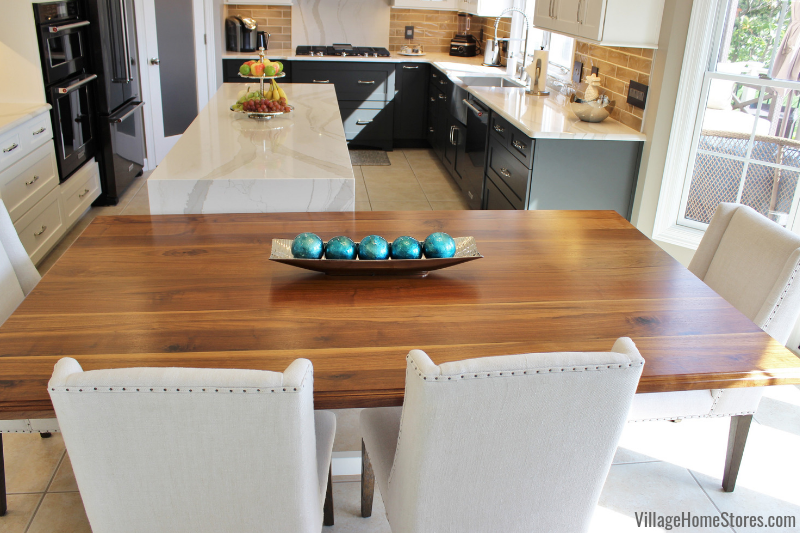 The Black Walnut plank-style wood top adds warmth and an upscale texture to the space. We think its is best complimented with the warm backslash tile glowing with our undercabinet lighting system. Can’t find the right table to match your new kitchen from Village? Let us make one for you to ensure that it lines up with the overall design concept! Finding the right size and finish can be tricky. But rest assured, we can build just about anything you can dream up. This rich, smooth Black Walnut top was given a stylish and classic “Ogee” edge profile. 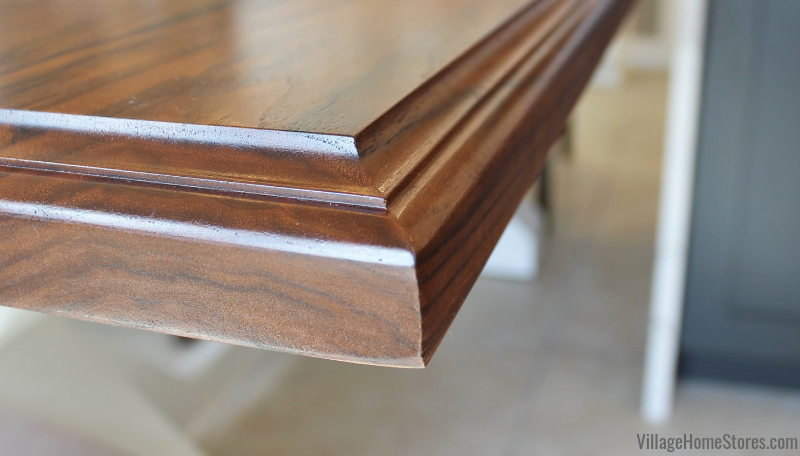 The feel and sheen of these wood tops are truly heirloom quality. Learn more about these wood tops here in a previous post. 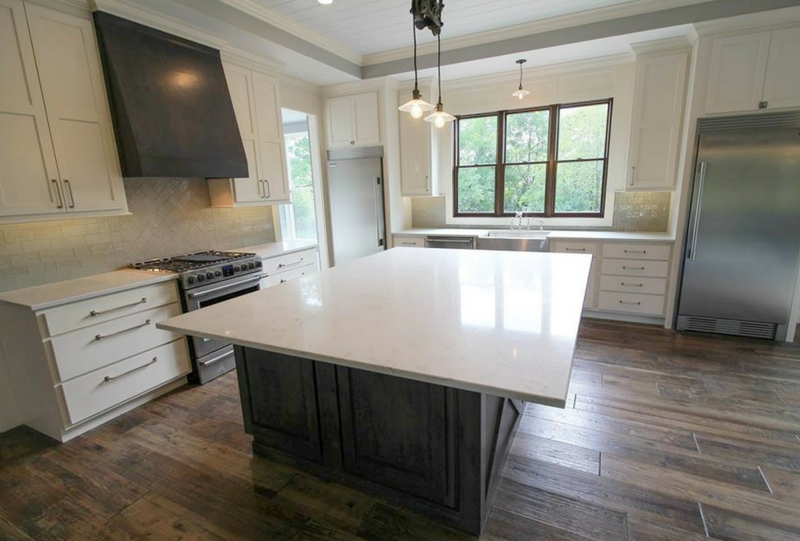 Even though this wood top is a showstopper, the Cambria Quartz in this kitchen is not to be ignored. Take a peek at this image below showing the remodel while it was still in progress. 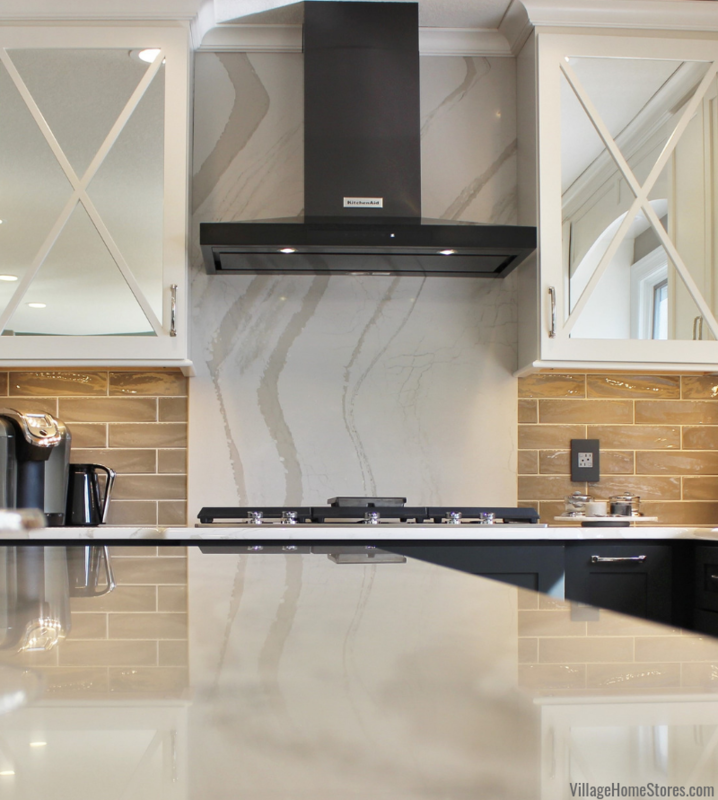 Notice that a piece of Cambria was installed on the cooktop wall for a dramatic look. 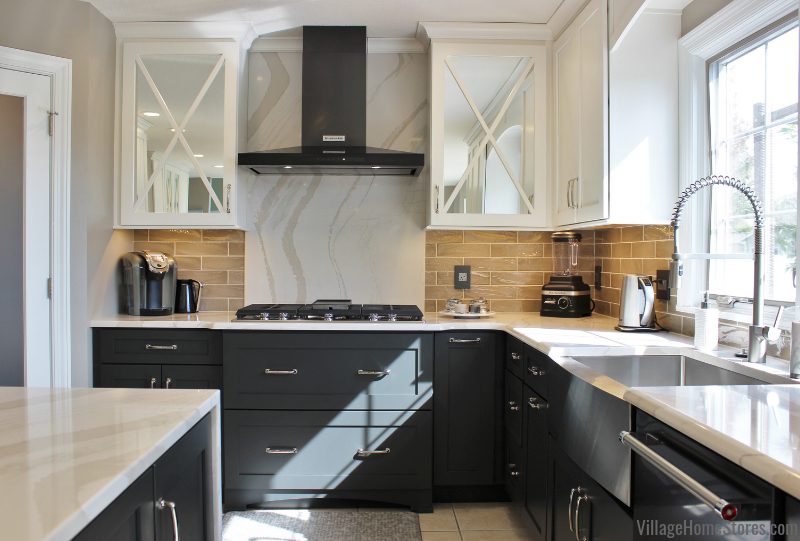 This statement wall creates a dramatic contrast of a marble look on the wall with a graphic black hood as an eye-catching continuation from the dark base cabinets. 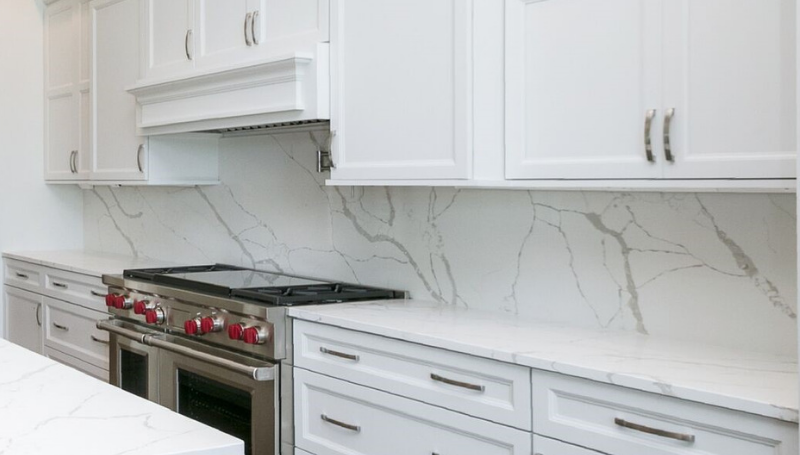 In fact, the Cambria Britannica Warm Quartz seems to almost cascade down behind the hood, flow up from the floor, over the kitchen island, and pour back down again on the other side. Of course a glassy, gloss finish in a bright space always adds a great upscale detail. 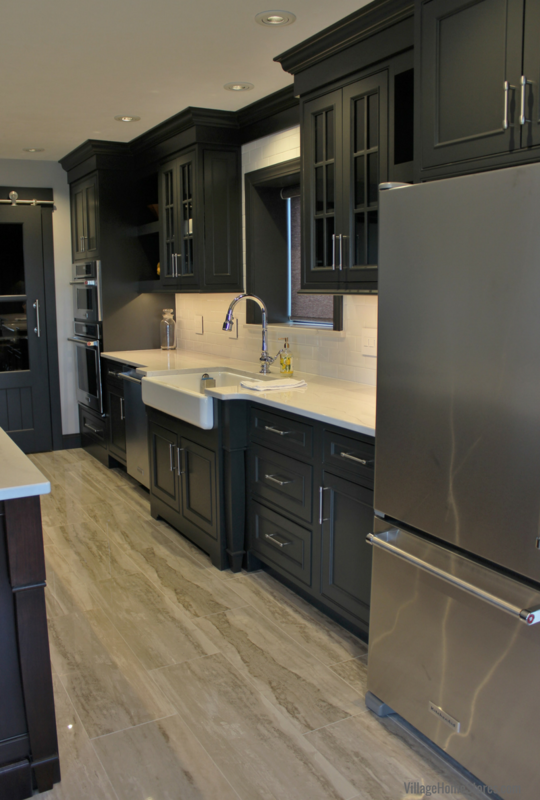 This Cambria design includes warm gray veining and is a classic compliment to the dark appliances and painted base cabinetry. A new approach to a two tone kitchen, dark painted bases with a bright and airy upper cabinet in a separate finish. 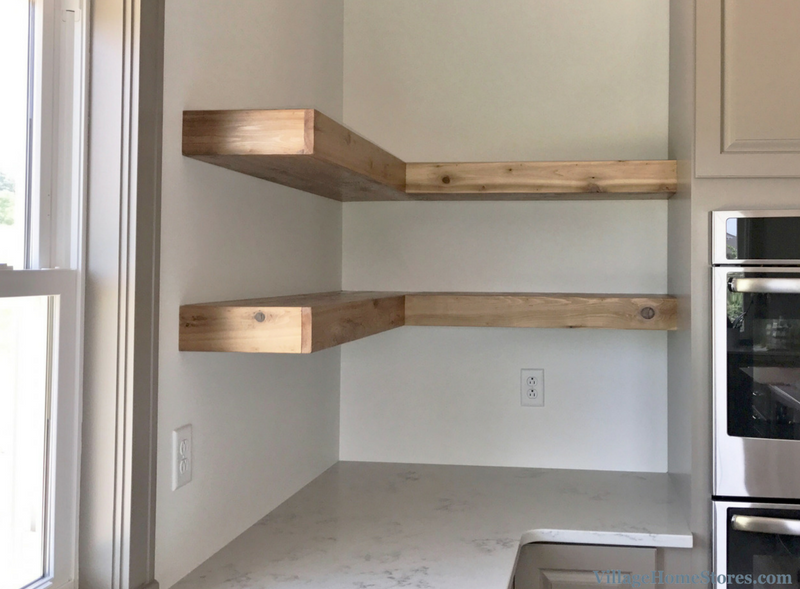 Many times this trend is installed with open or floating shelves for the upper cabinetry. But in this design, we wanted to provide as much usable storage as possible. 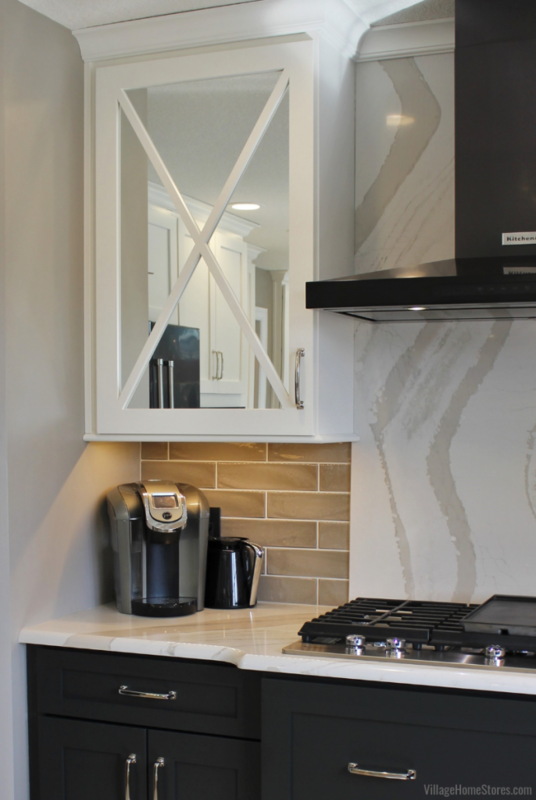 The use of mirrors in some of the wall cabinetry does add a lighter weight to the look of the upper cabinets. 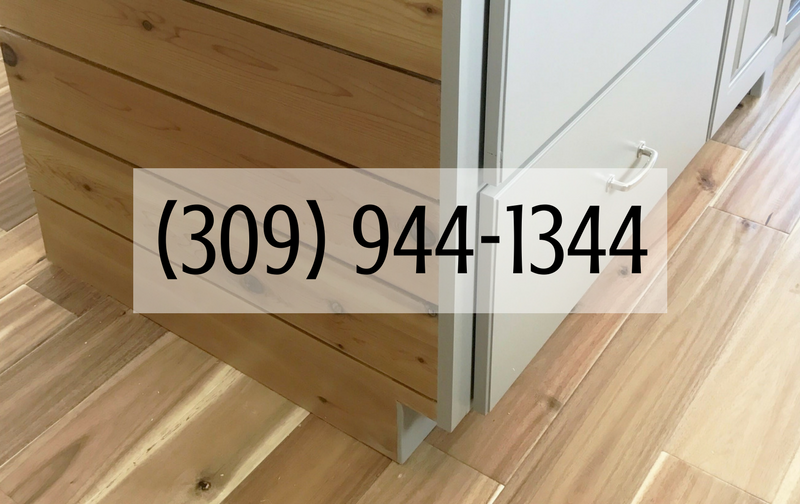 The “X” design in the cabinet door is an updated and more Transitional style detail. We love the way mirrors help to brighten up a room (plus conceal the cabinet interior). 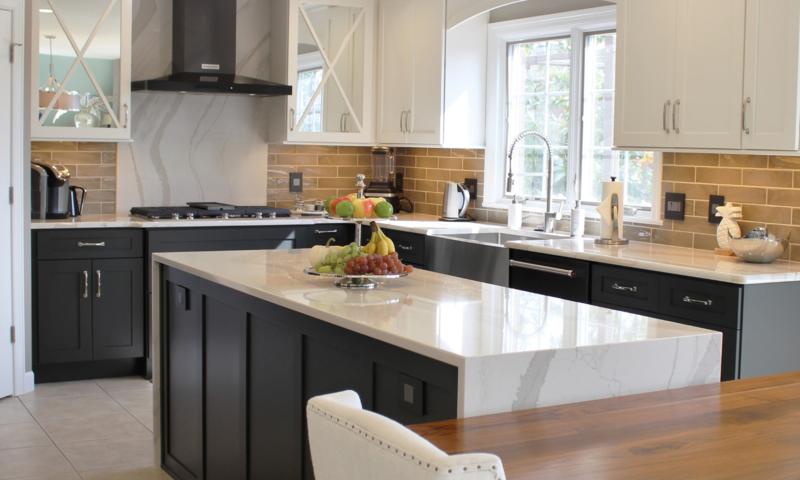 Quartz in a marble look is a great choice for a busy kitchen and large island work surface like this. 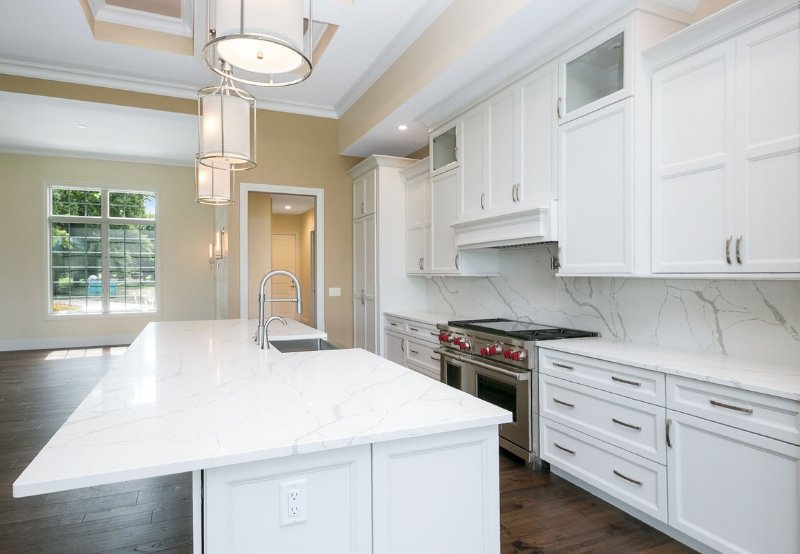 Cambria Quartz in the Brittanicca Warm design offers a classic look of a marble with a maintenance-free advantage. 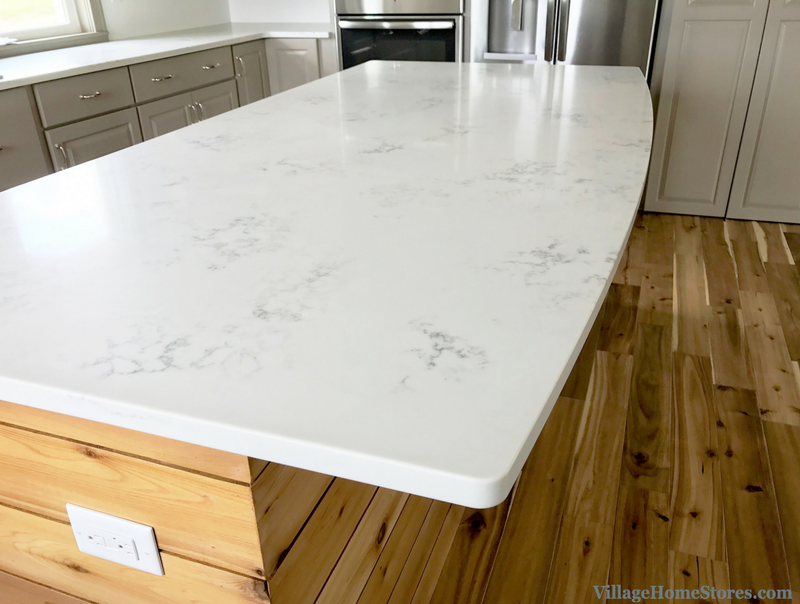 The island countertop has a standard “Eased” edge applied to it to maintain a cleaner installation and look with the waterfalling edge. Curious about waterfall edges? Stop by our showroom in Downtown Geneseo and see our front desk area that showcases this look. 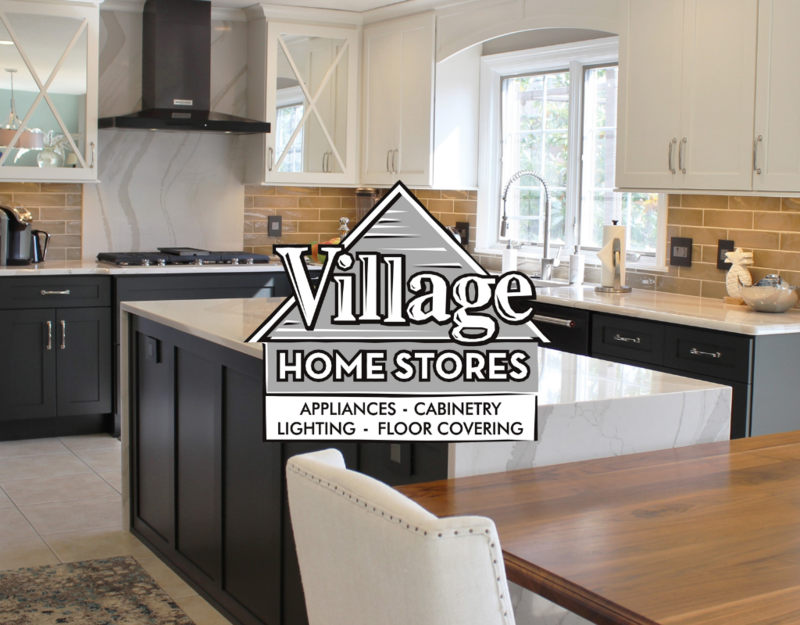 Village Home Stores offers many departments all under one roof to make the entire selection process easier on you and your designer. We encourage you to come with any ideas you have collected during your research phase but also take a look around and inside all of our cabinetry displays. 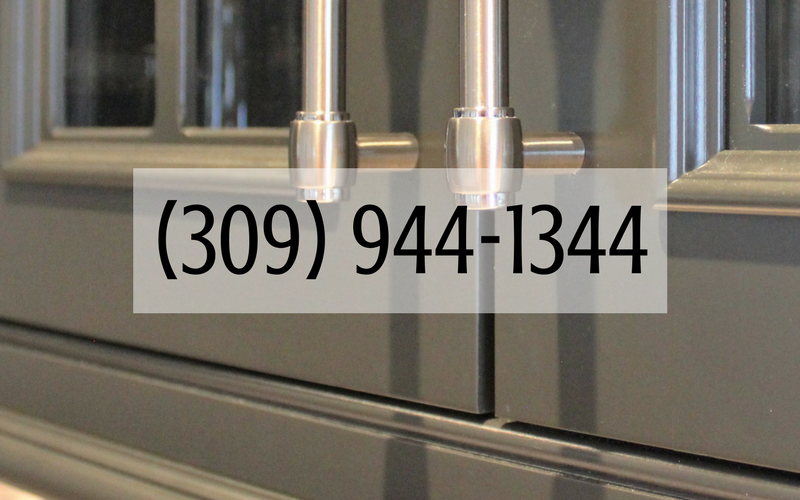 We offer so many specialty cabinets and can show them to you. 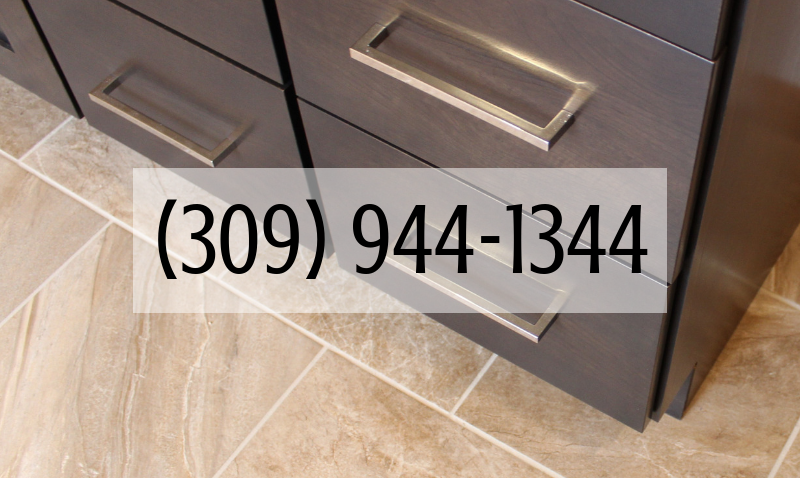 Our Dura Supreme line of cabinetry is loaded with so many great options! 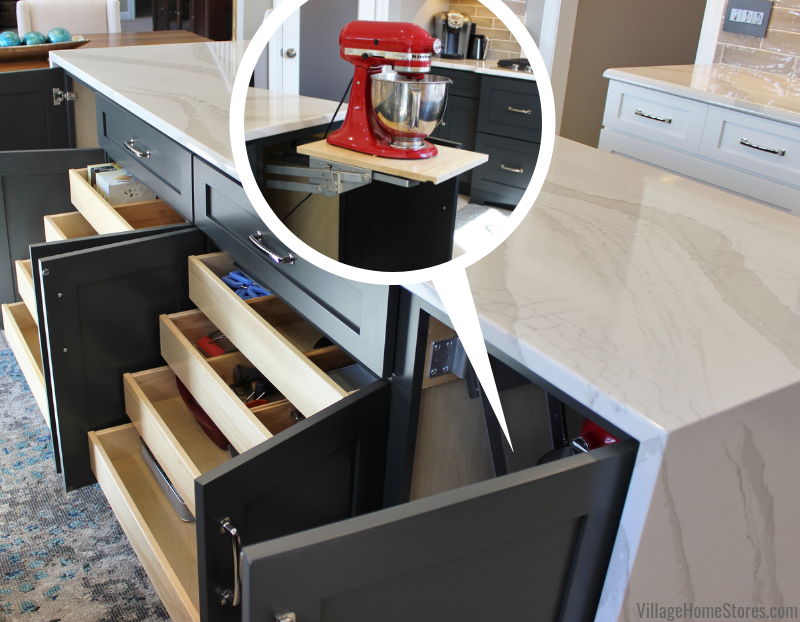 This kitchen of includes great sliding shelf storage but also a mixer lift cabinet right in the island. 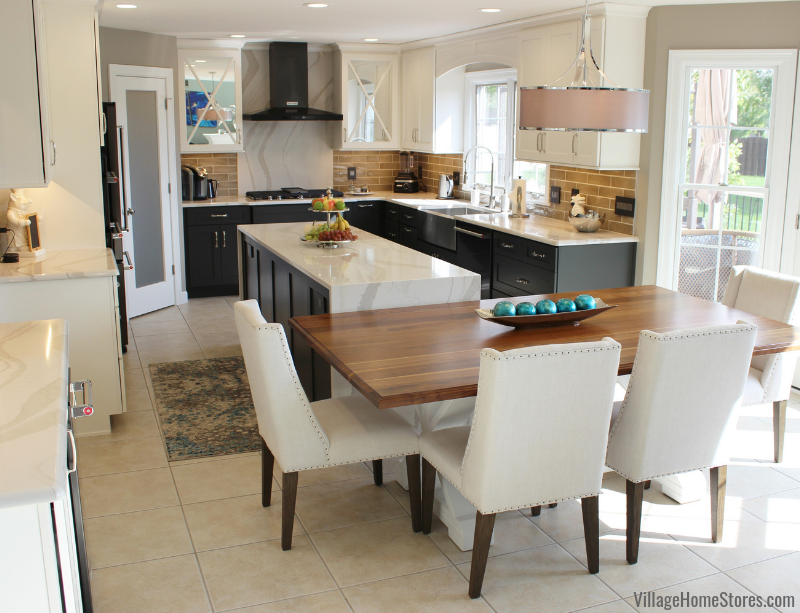 See more of this entire kitchen in detail over on our Best of Houzz-winning Portfolio. See the full album of images here. We also installed a spice pullout, lazy susan, and an auto-open waste basket! Press play below to watch the waste basket cabinet open with just a nudge. 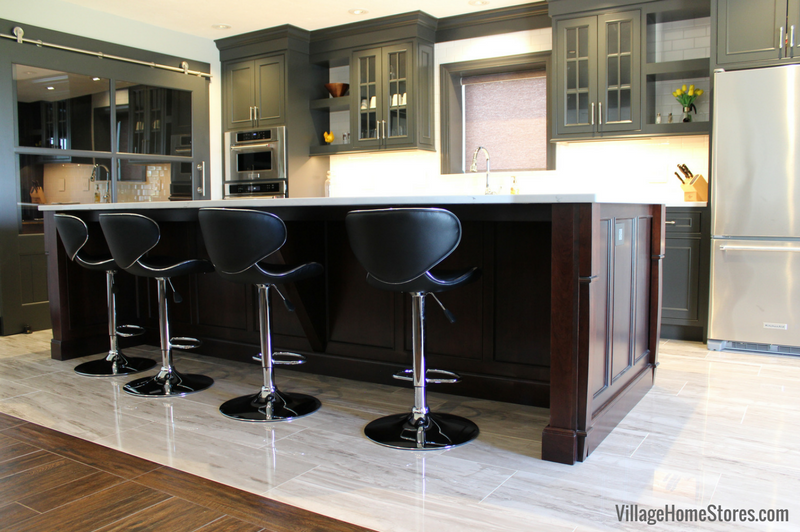 Matte Black is one of our favorite home trends and this kitchen rocks the trend so well! The soft, rich look of Dura Supreme’s painted “Graphite” finish on the base cabinetry pairs so well with KitchenAid’s Black Stainless Steel finish appliances. Black Stainless is not just for super contemporary spaces. This Transitionally-styled space is proof of that. Plus it is fingerprint resistant! KitchenAid was the first in their industry to launch a Black Stainless Steel finish and the look is sophisticated. But a KitchenAid kitchen is at it’s best when in use! A counter-depth French Door refrigerator includes incredible fresh and frozen food storage. A 30″ Combination Wall Oven and Microwave has so many features and a large capacity when needed. 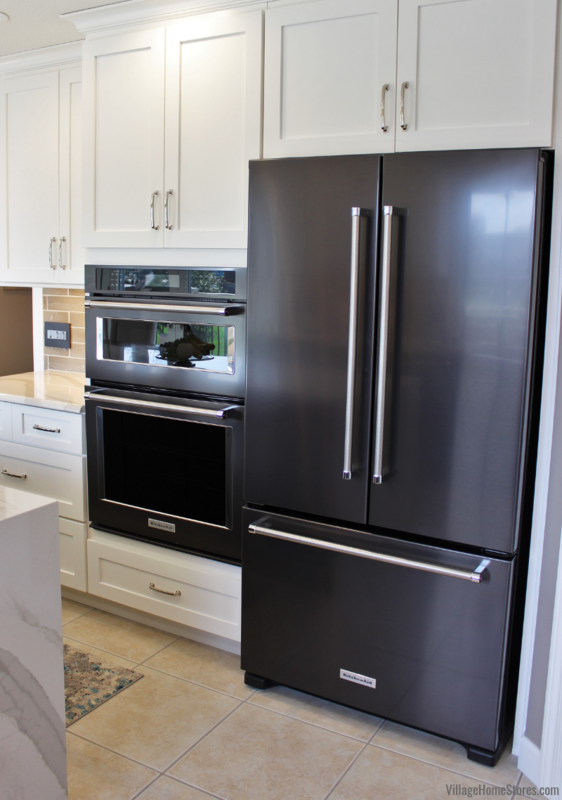 Another great appliance detail in this kitchen is the undercounter 15″ Ice Maker. What an absolute dream for anyone who entertains! Of course when you have a pool… people tend to show up. This 15″ automatic ice maker produces ice that is perfect for every occasion. It opens to reveal a storage bin that can hold up to 25 pounds of ice. 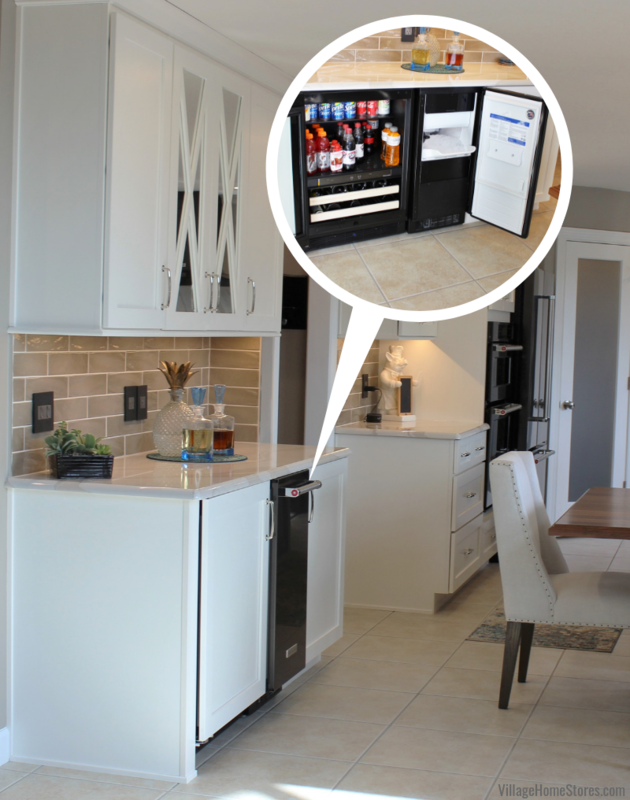 Next to the Ice Maker we installed a beverage cooler with a custom panel to match the cabinetry. This kept the beverage area of the new kitchen looking symmetrical. Panel-ready appliances can be a wonderful custom option. We offer them in many refrigerator and dishwasher options. We kept the original tile floors in the kitchen but a new tile backsplash was installed. 3″ x 12″ textured tiles in “New Yorker” series and “Taupe” color. We love how they almost have the appearance of being underwater with their texture and reflection. 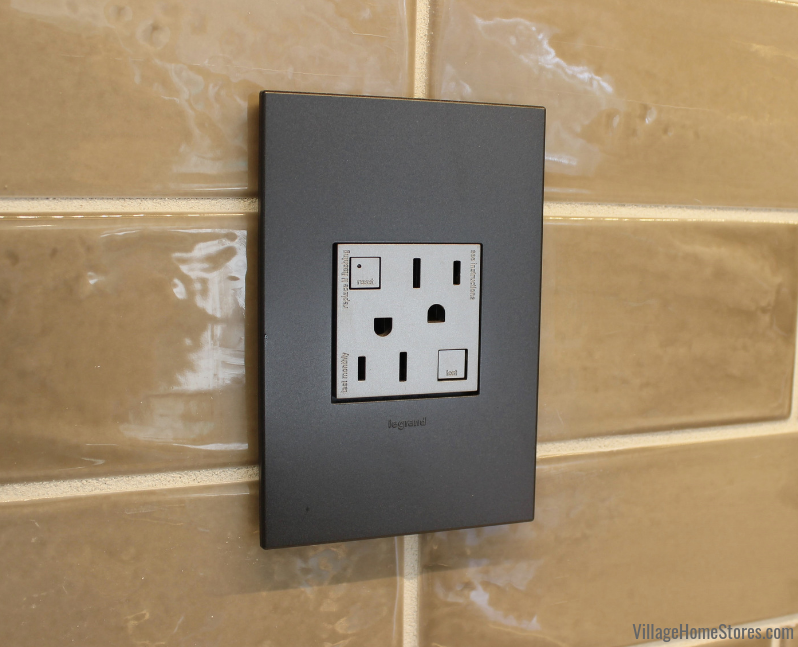 Our stylish adorne series of switches and outlets from legrand looks great on the tile in a contrasting color and matte finish. The square design of this series looks great and is very versitile with options. Since sart home tech is at the top of every homeowner and homebuyer’s wishlist we should also mention this kitchen lighting system takes voice commands! 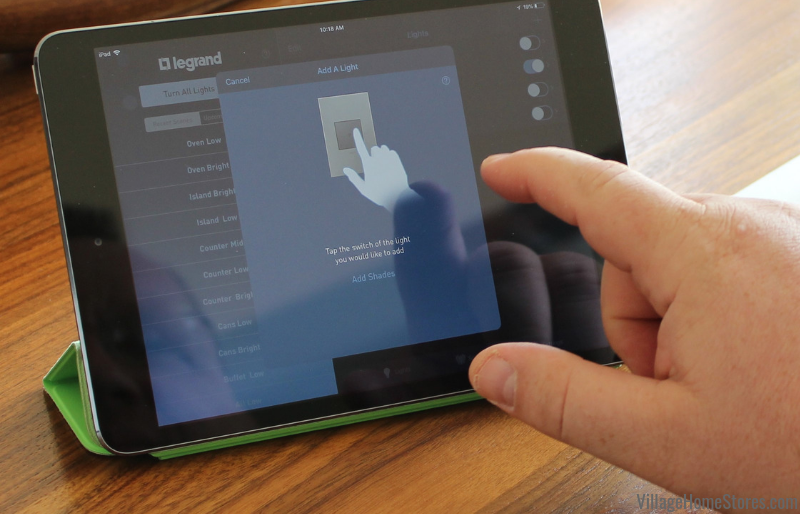 Using the legrand app and connected to an amazon Alexa, we had a lot of fun testing out this new product. Press play below to watch a Facebook live video we taped at this completed jobsite to see how easy it is to use voice commands with this adorne system. Smart home tech has reached the kitchen industry in a big way over the last few years and this year even more products are set to launch to make your life easier and more enjoyable. This homeowner was able to connect many of the lighting switches in the home and now can even switch lights off and on when they are away from home using the app. We have completed many new spaces using the adorne series from legrand. 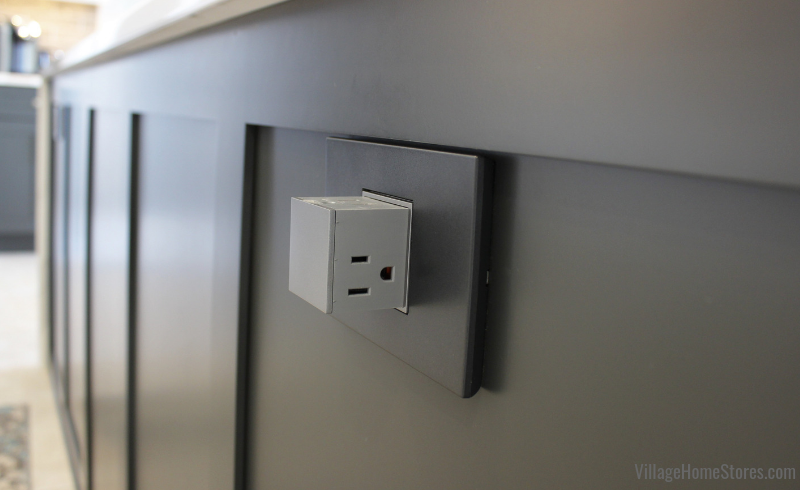 These outlet covers are a perfect match to the painted Graphite cabinetry in this kitchen. They match so well that our “hidden” pop-up outlet in the island is totally camouflaged when it isn’t in use. A hands-free waste basket cabinet, voice-controlled lighting, and even a wave-controlled kitchen faucet! 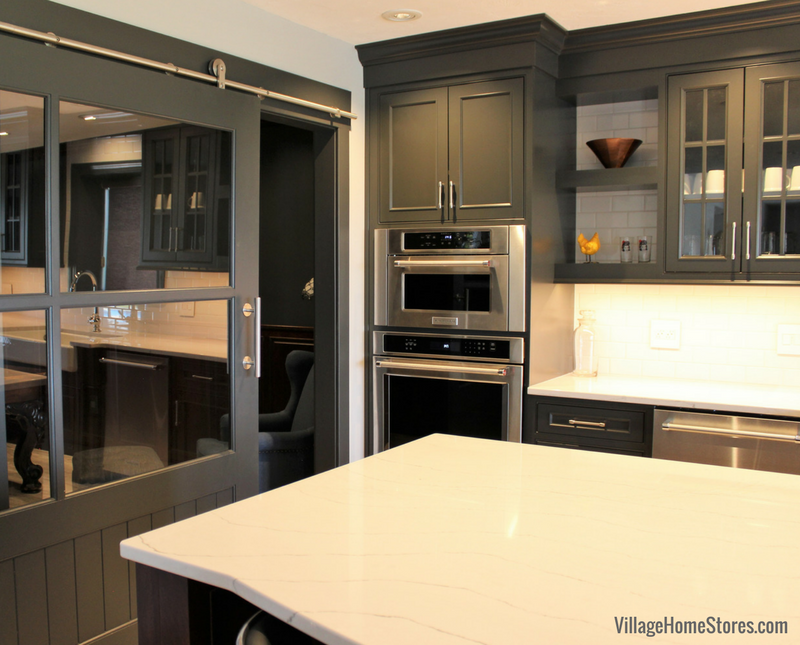 There is just so much from this kitchen remodel story it is almost impossible to showcase it all here on the blog. We hope to film an upcoming episode of the Village Home Show to show you more of these great features in action. 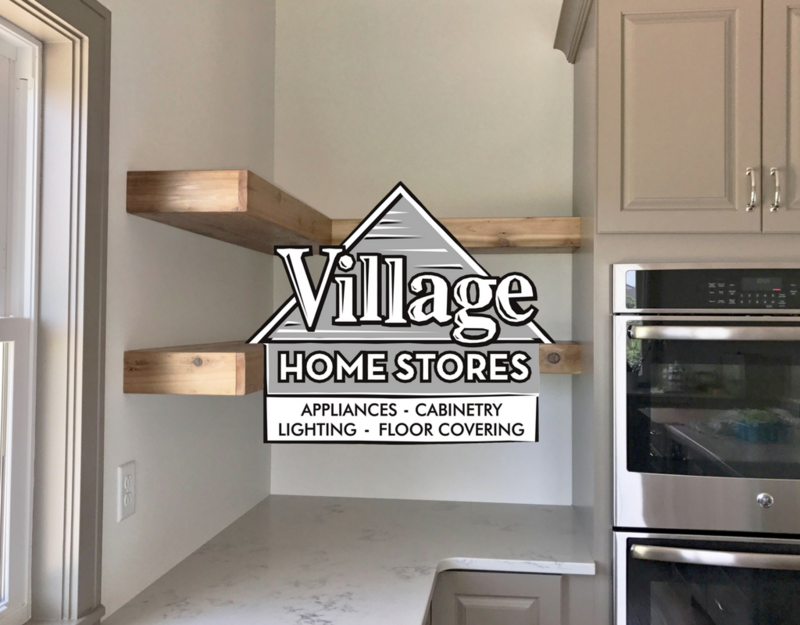 These clients used the Complete Project Management Program at Village Home Stores for their project. We can provide you with an expert design and material selection for your project and you can take it from there. But for those who need us to manage the project from start to finish, the Complete Project Management Program at Village Home Stores is available. We are constantly changing and adapting this process to give our customers the very best experience for their investment with us. 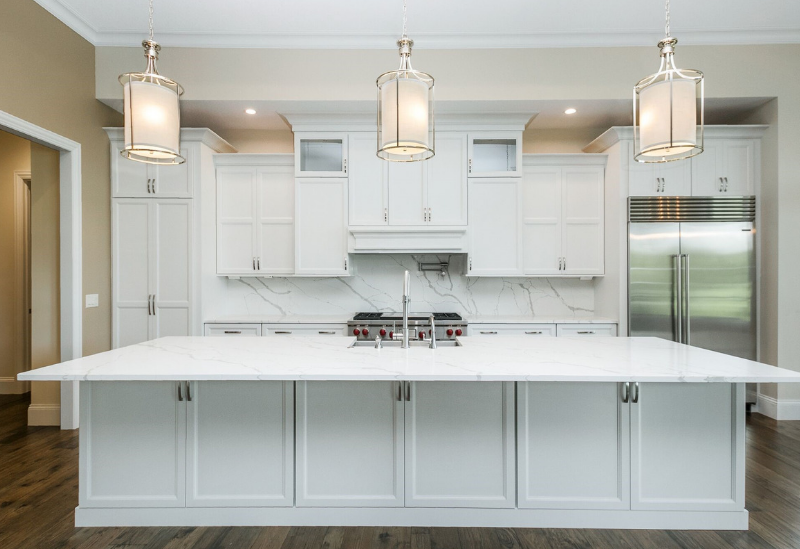 Our goal is to get your project completed on time, on budget, and to the level of quality we would expect in our own homes. 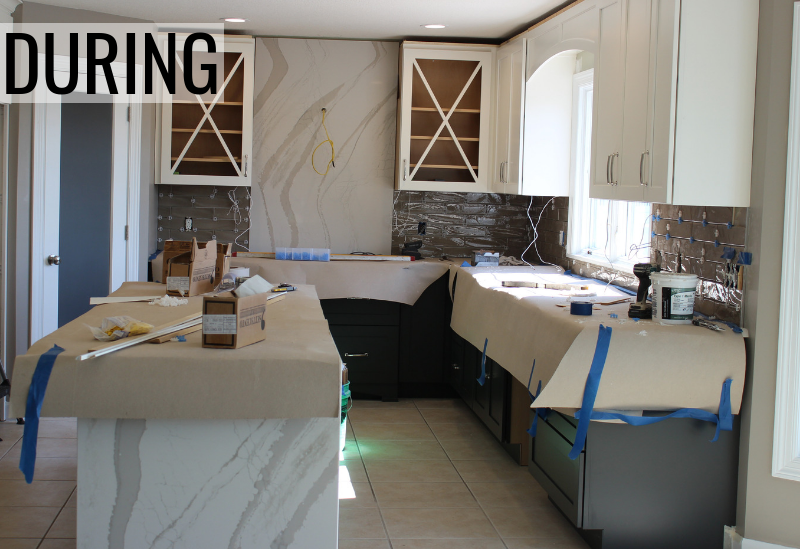 Press play below to watch a 360 view of this kitchen remodel from start to finish. Ready to start your own before and after story? We are ready to be a part of it! Your first step is to reach out to our team. You can do that by calling us at (309) 944-1344 or completing this short online form on our website. 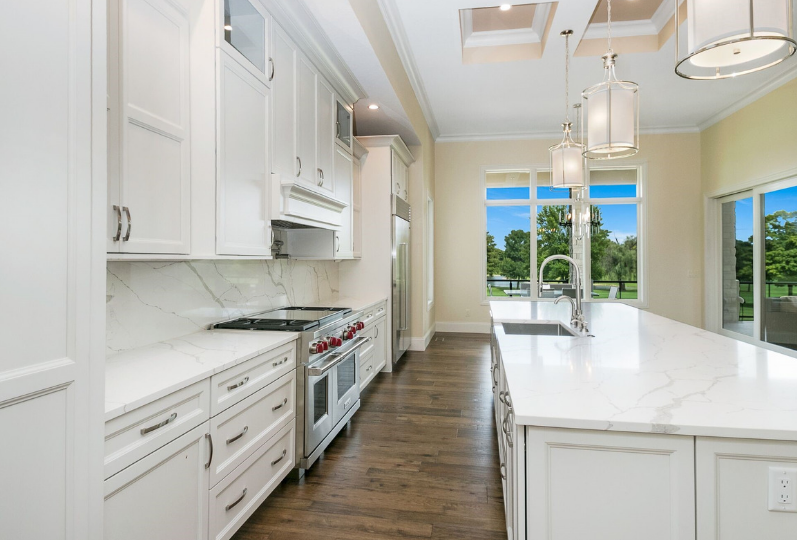 We can’t wait to hear what your dream kitchen looks like and how we can make it happen. Don’t forget that we offer many payment options including financing programs available for those who qualify. Learn more about our payment options here. Thank you so much for checking out this blog tour. We hope you will keep an eye here for more great spaces featured from right here in the Quad Cities area. The Modern Farmhouse style has taken the ENTIRE country by storm. Of course the Midwest Region has embraced this style because… well we were all already on board! 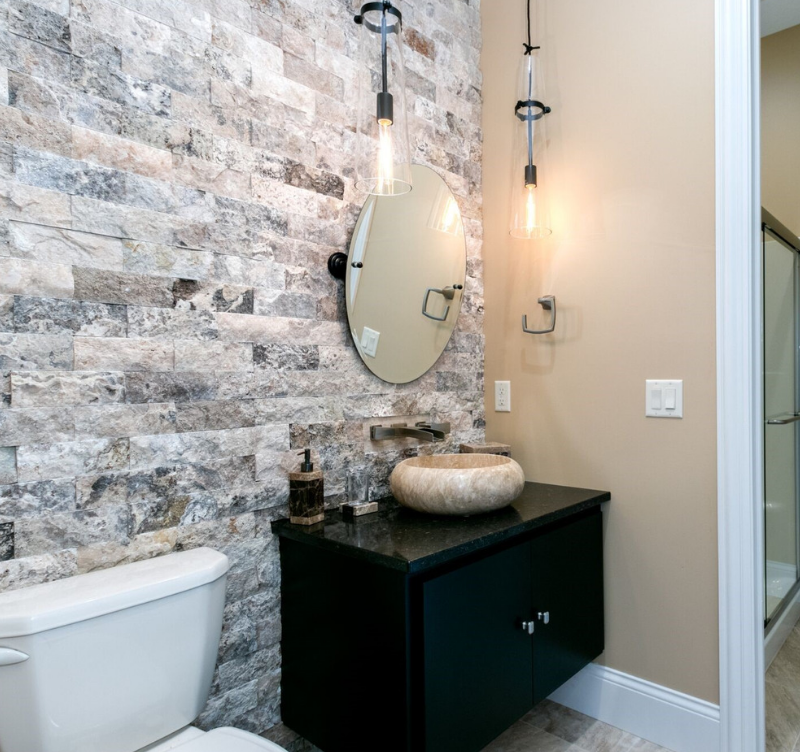 We are so lucky to partner with a local builder that masters this look in a refined and stylish way. 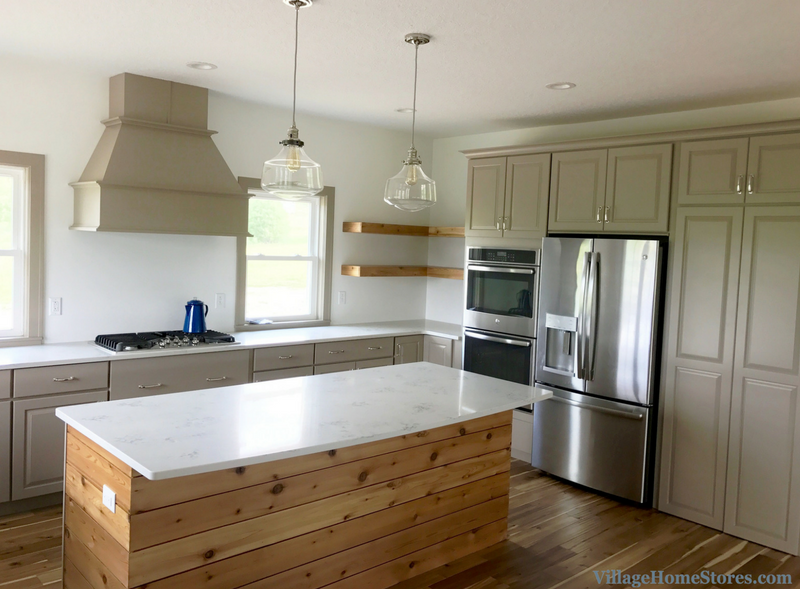 Take a look at the kitchen in an urban farmstead recently built by Applestone Homes in the heart of the Iowa Quad Cities. The Modern Farmhouse style is about large, airy, and spacious spaces full of character and texture. Kitchen designs including islands and casual dining spaces built for gathering. Finding new ways to style a space with antiques and unique pieces. Nothing new to our Quad Cities market! The perimeter of this kitchen design includes cabinetry from our Koch Classic line in the “Prairie” door and painted “Pearl” finish. 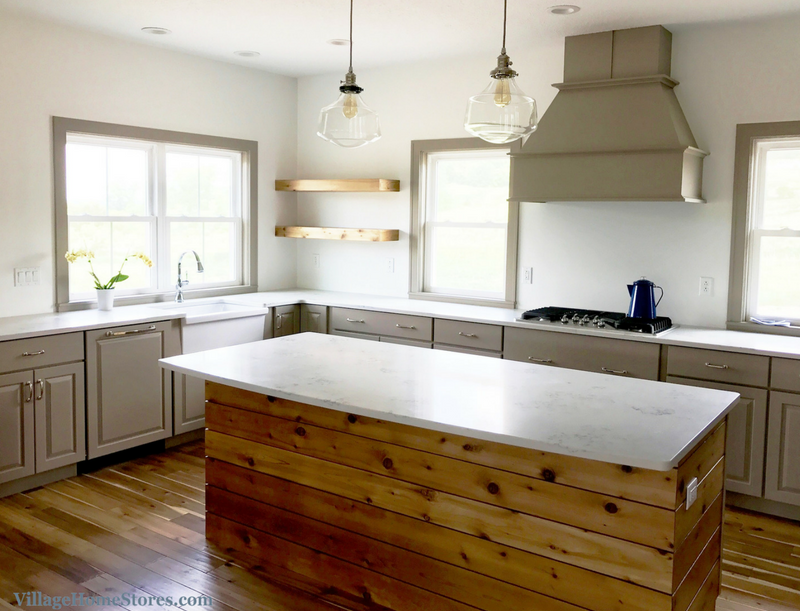 If large spaces for gathering to prepare, eat, and enjoy means Modern Farmhouse… this island is expert-level farmhouse! Just look at that huge, open counter perfect for so many functions. Large drawer stacks face the cooking zone of the kitchen for pots, pans, and serving dishes. The island and pantry cabinets are in the “Hastings” door and a Rustic Beech wood stained the “Stone” finish. One huge advantage to embracing the Modern Farmhouse style in the Quad Cities vs. anywhere else… the views out of the window. 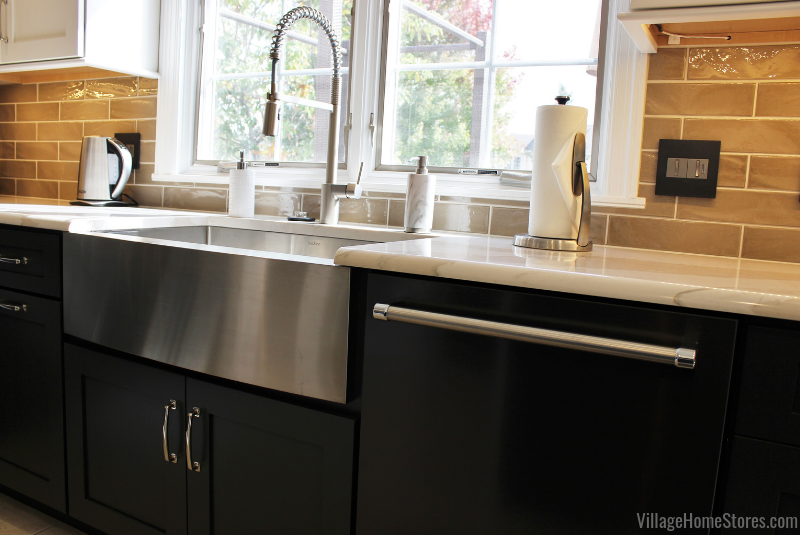 An apron-front sink that looks out to watch the Midwest seasons change is one of the best gifts you can give any new home owner. 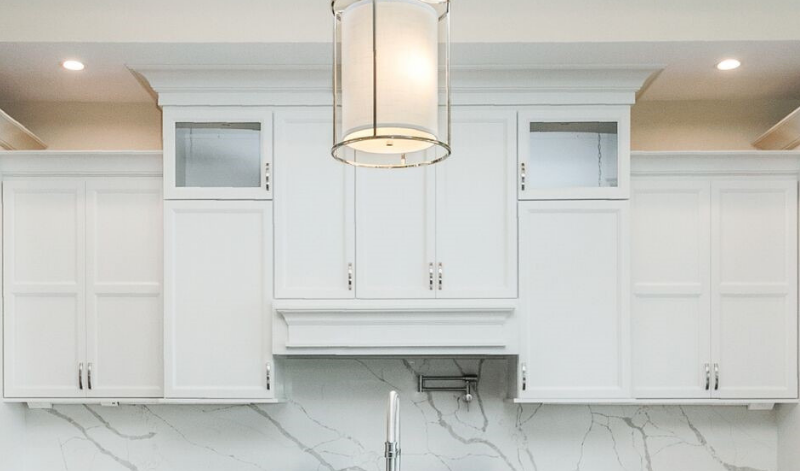 We love the back panel design selected for the kitchen island. The “X” style is a nod to barn doors and also helps to break up the smooth paneled surface. 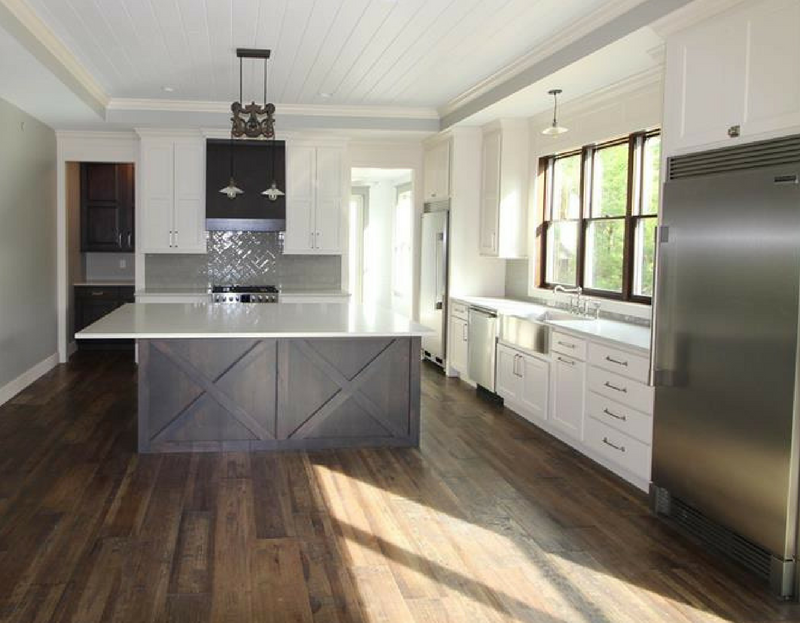 We didn’t just provide the kitchen cabinetry design for this home. 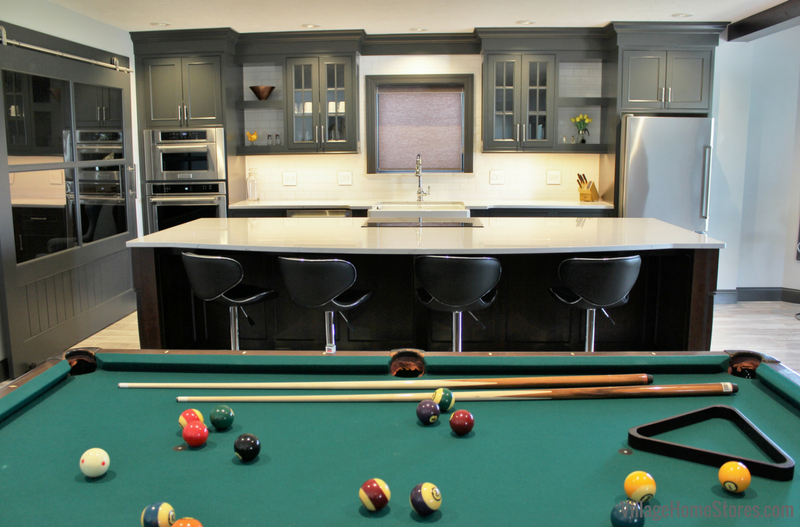 We also provided a bar area and bath cabinetry. 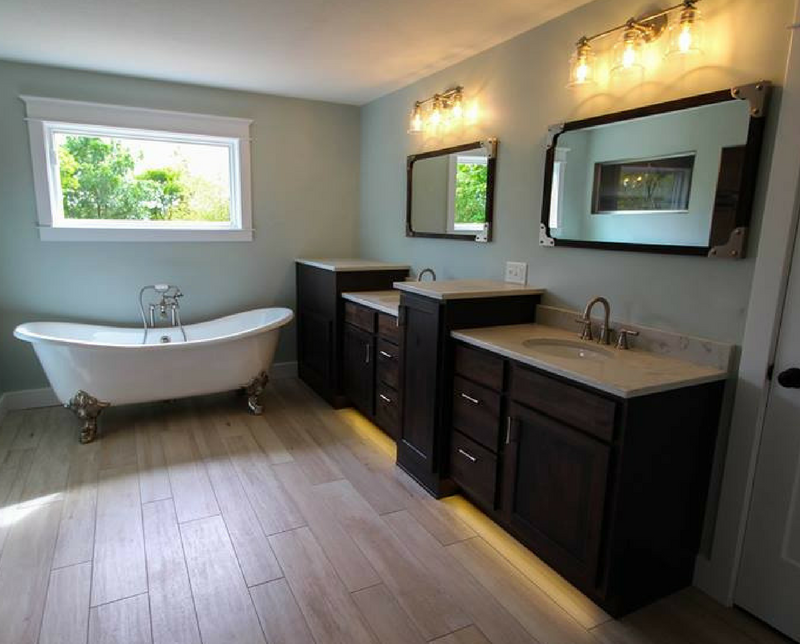 This Master Bathroom is so gorgeous. The same “Stone” stain in a Rustic Beech wood has been applied to the “Vicksburg” doorstyle. We love the break in the heights and depths of the cabinetry. It creates interest and helps to divide the two sink areas.Vanity tops with integrated sinks make for easy cleanup. A two-toned color selection from The Onyx Collection gives the illusion of an under-mounted vanity bowl. 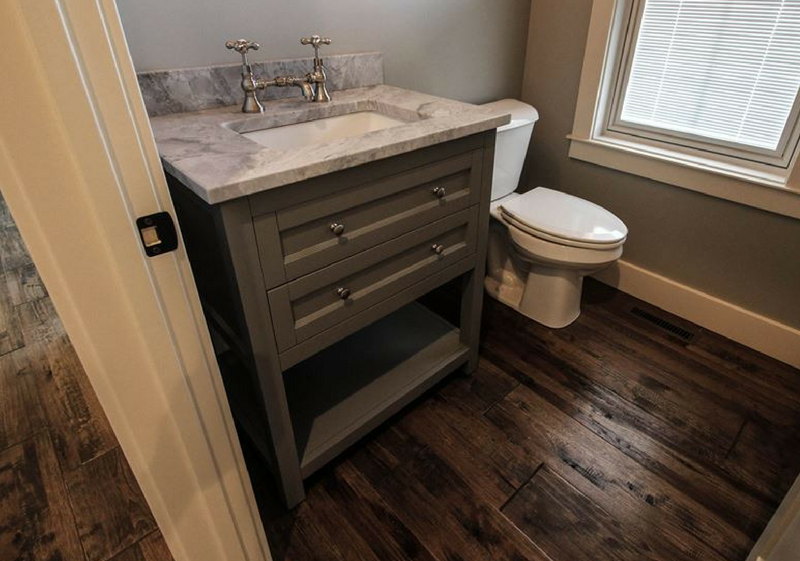 In the Powder Room is a furniture-style vanity. Some hidden storage beneath the sink and an open shelf below. This entire home is Modern Farmhouse perfection! 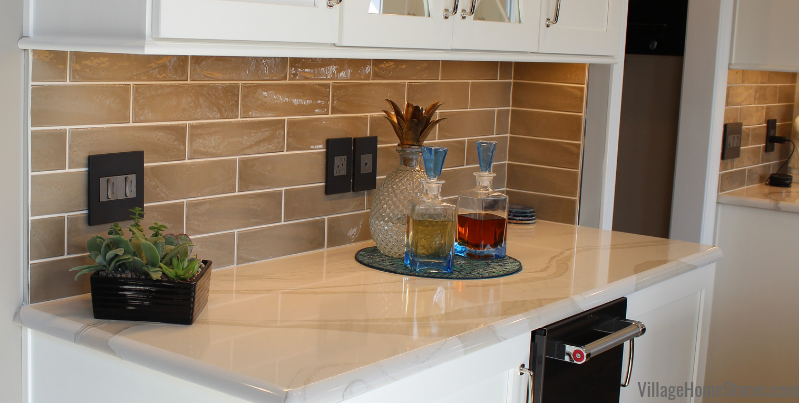 We are always so happen when our products can be installed expertly and then styled tastefully. 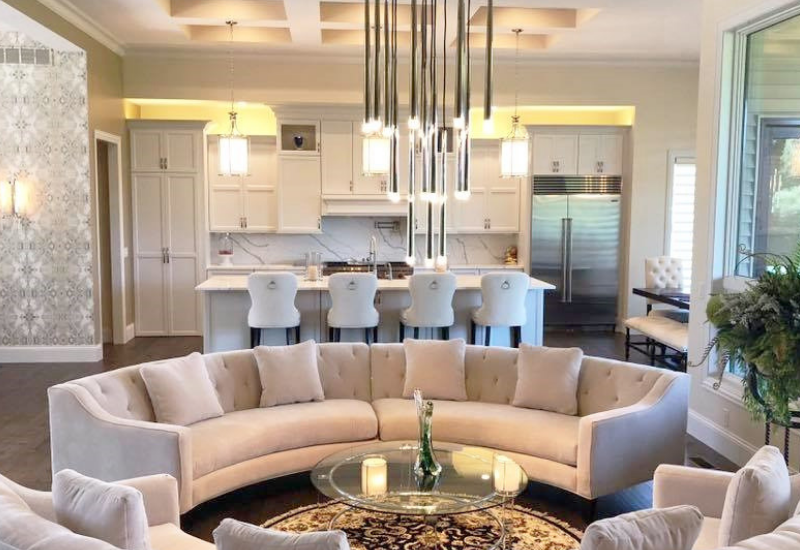 Applestone Homes masters both of these key elements in creating a comfortable but impressive new home for their clients. Photo provided by Applestone Homes. Want to learn more about Applestone Homes? Check them out on facebook here or follow them on Instagram here. This featured home is not for sale but the look and feel can be recreated for you by the team at Applestone. Did we mention that this farmstead isn’t set out in the rural rolling hills of the Iowa countryside…. it’s right in the middle of town! All of the vibes of a rural retreat but the perfect lot and builder combination has made it work hidden away right in Bettendorf. Want to capture this look for your own kitchen? Your first step is to reach out. 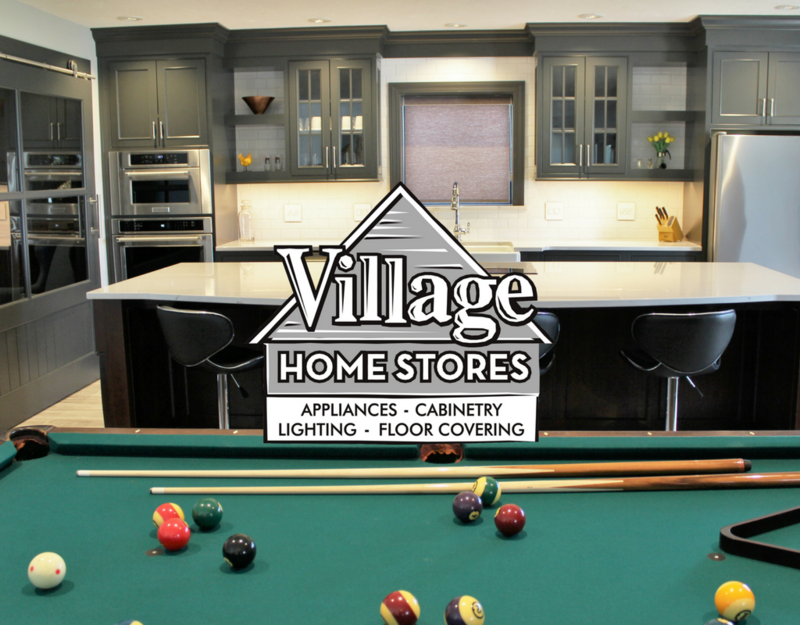 Call us at (309) 944-1344 contact us online here, or email us at info@villagehomestores.com. We can’t wait to hear what you are working on! This week’s featured project is located at a new home built in Andalusia, IL by Hazelwood Homes. 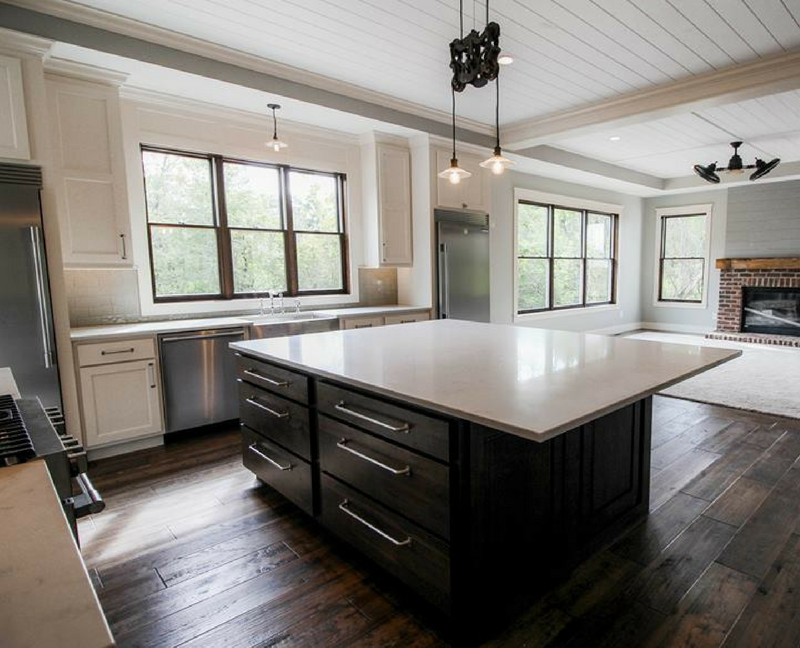 Kitchen design in the Midwest is trending toward open, airy, and inviting spaces. 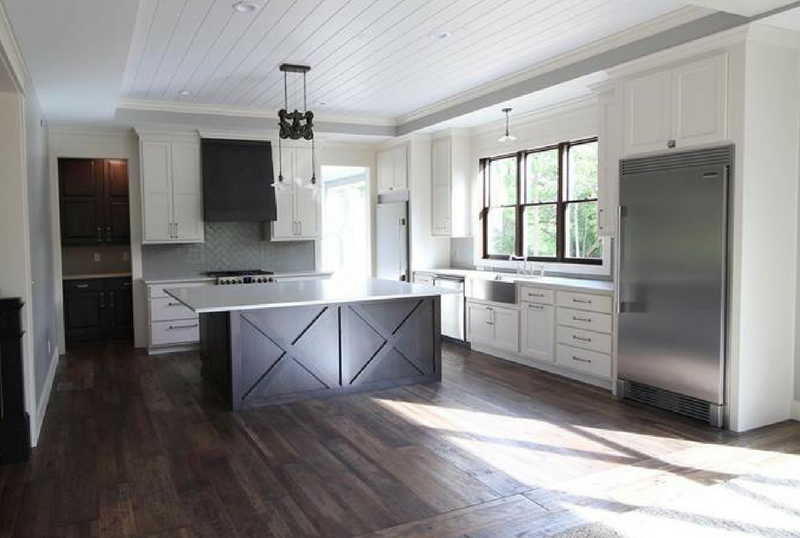 This layout and selection of materials is a perfect way to showcase a Transitional style with some farmhouse details. 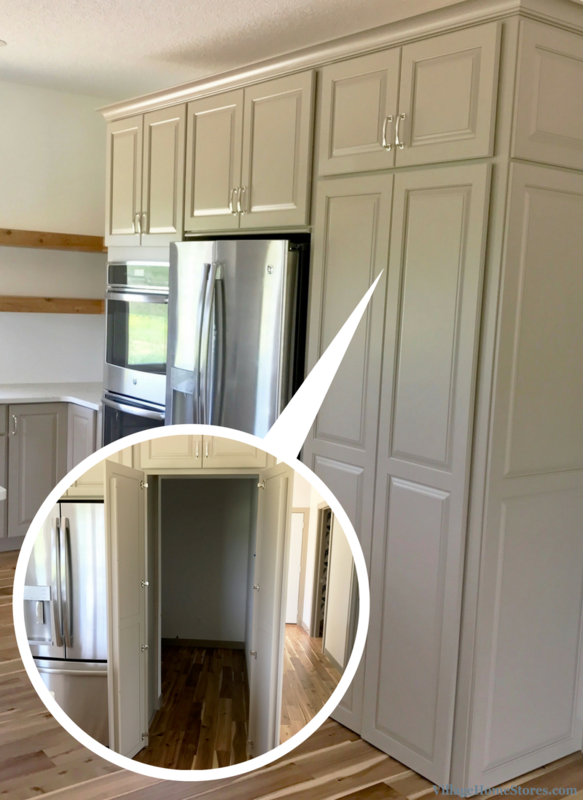 …it’s a walk-through pantry front! This design gives the solid look of a cabinet custom fit to the wall in the kitchen. When the doors open, it reveal a walk-in pantry area that turns back behind the refrigerator space. So when seeing this beautiful open and airy look, don’t worry about the lack of wall cabinet storage. The huge pantry area provides so much shelf space! What a stunning look! The customer arranged to have rustic wood surround the back of the kitchen island and the floating shelves in the same wood look perfect! We love the pairing of a smooth, solid finish painted cabinet with rustic details. The knotty wood adds character and texture to the space. 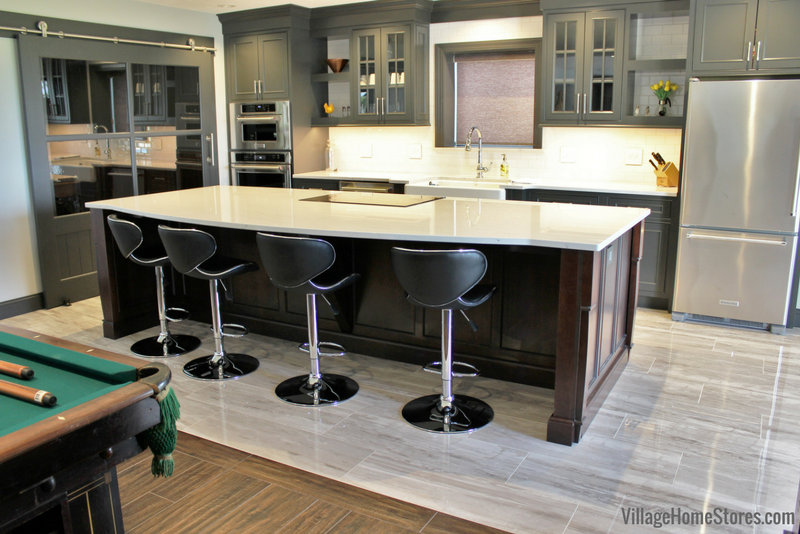 There is so much to be said about being able to design a single-level kitchen island without a sink or cooktop in it. Just think of how many times in the last few Holiday weeks that you wished you had a large surface for working on. Cookie decorating, gift-wrapping, and serving food would all be amazing on this large island surface. There is even an overhang for counter-height seating. 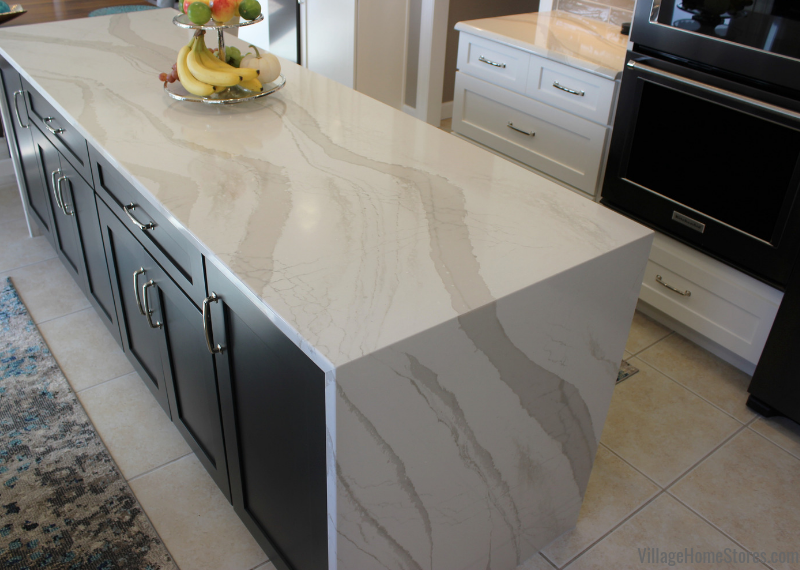 Engineered Quartz in the “Carrara Grigio” color gives the look of a marble with the maintenance-free appeal. A classic and durable choice. The floating shelves and clear glass island pendants help keep the kitchen walls feeling open and airy. Another player in this is the custom wood hood above the cooktop. 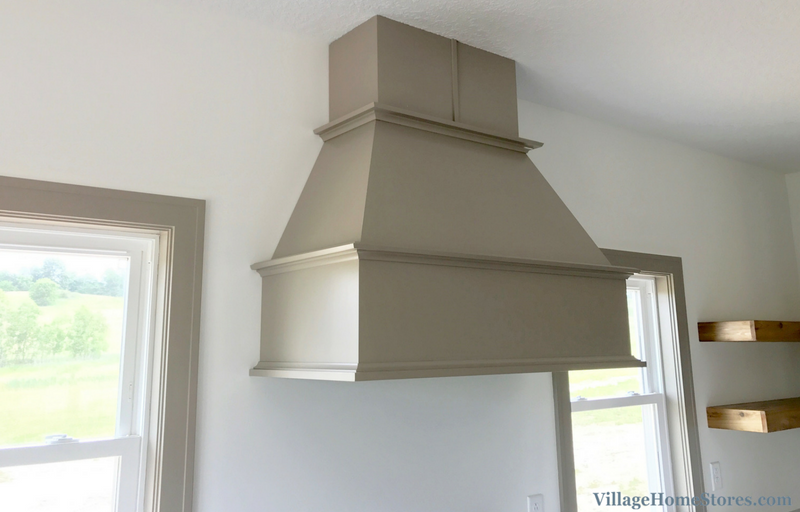 We can create wood hoods to pair with any kitchen style. 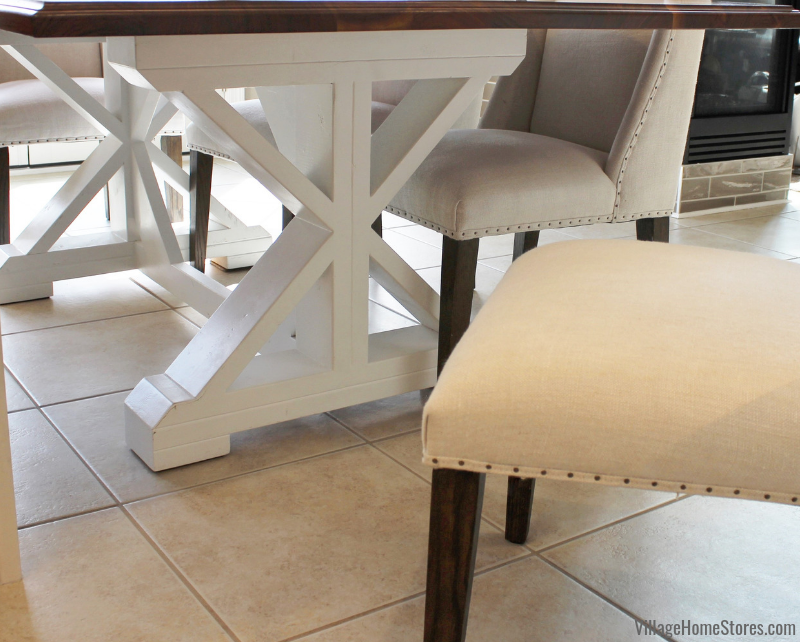 From simple and clean-lined looks like this, to ornate and decorative options. We have them all! Plus you can fit the interior of these hood with blower inserts of many types. You can customize your power and exhaust options all concealed within and the look is great! The cabinets in this kitchen are a great new neutral option from our Koch line of cabinetry. The “Taupe” painted finish has been applied to a paint-grade maple in the Seneca door. 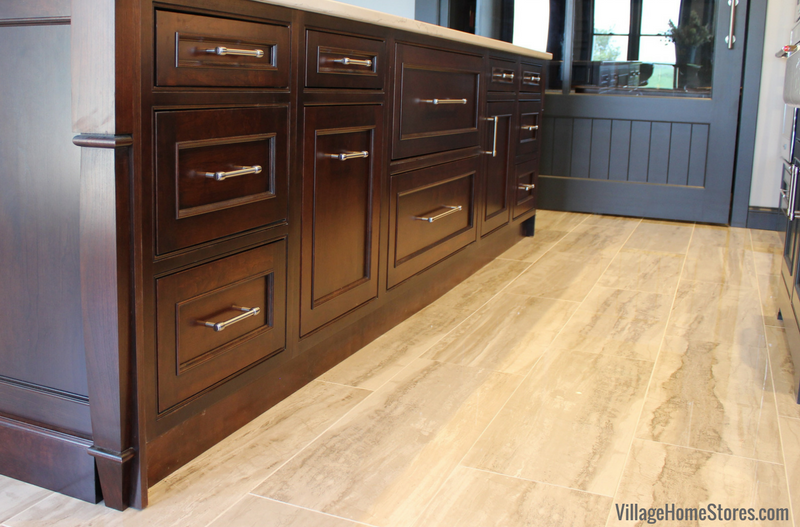 The flooring this this kitchen is from our LW Mountain line. It is an Acacia handscraped engineered wood in a “Natural” finish. Ready to get started on your own dream kitchen like this? Your first step is to reach out. 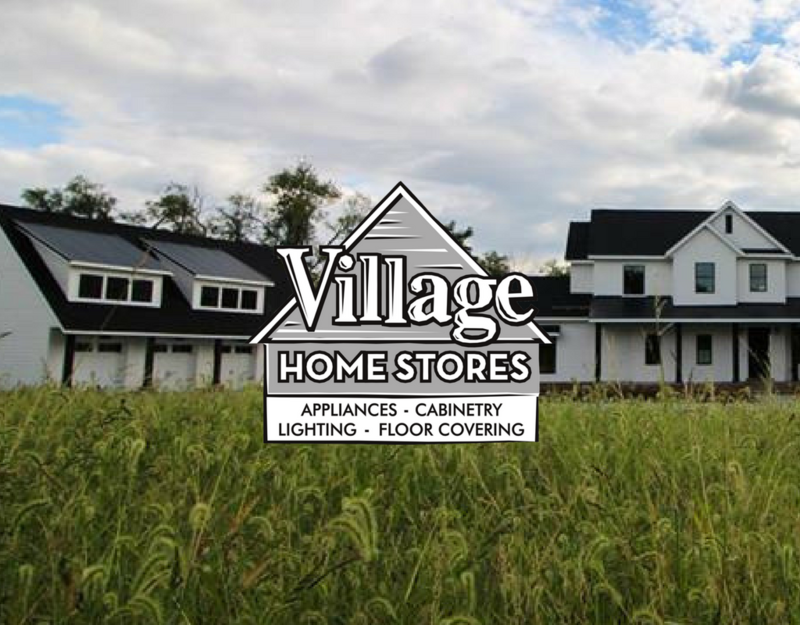 Our staff can walk you through the Village Home Stores process. Building a new home, or remodeling the one you are in? Either way we are your expert team! 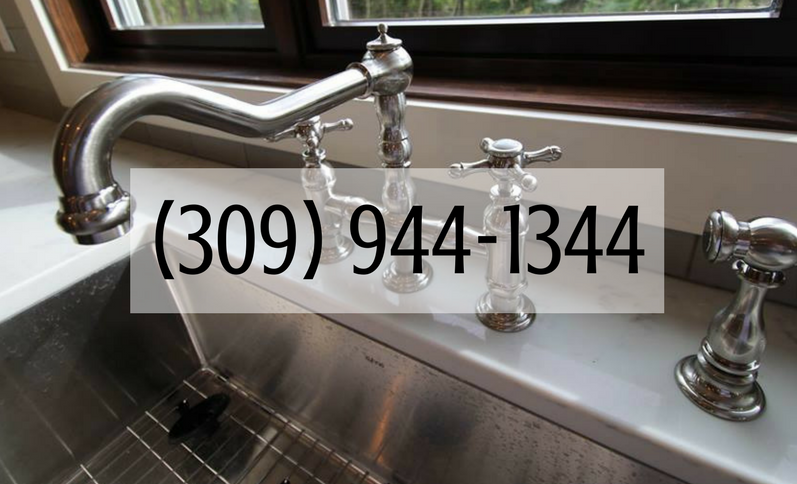 Contact us today by calling (309) 944-1344 or submit a message to us here online. We can’t wait to hear what you are working on!